This week I am in Ohio, staying in our old family farmhouse. When I arrived my parents were excited to tell me of a development that has rocked the neighborhood. 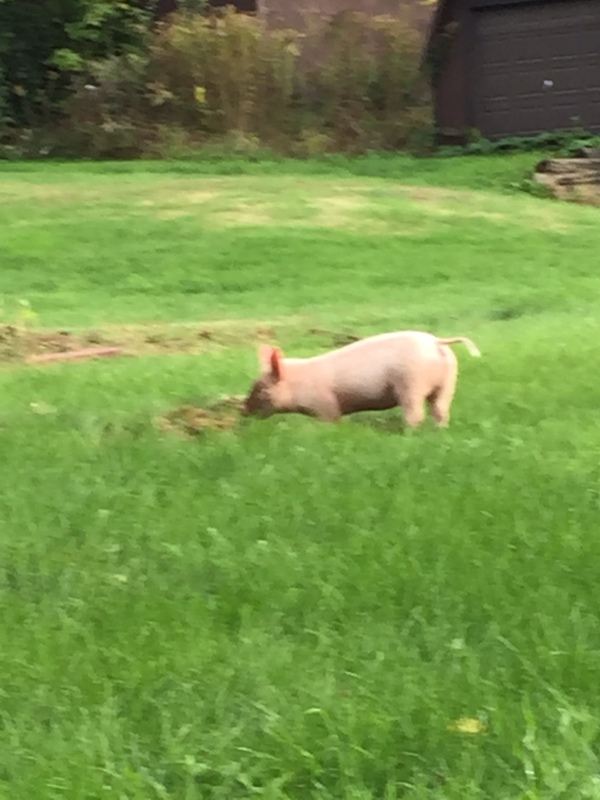 A young pig has become a local celebrity. He was an escape artist from the weekly farm animal auction. He has been living down by the creek now for lo, a whole week. Feral. You know a pig in these parts is not going to get by for very long without being chased down. He is someone’s property. But the masses who chased him became half-hearted and sullen after he eluded one after the other, running for his life from the humans who would catch him. He immediately set up housekeeping next to the apple tree and the tomato plants—dripping harvest fruits at the end of the season. Then he began to make his own garden. 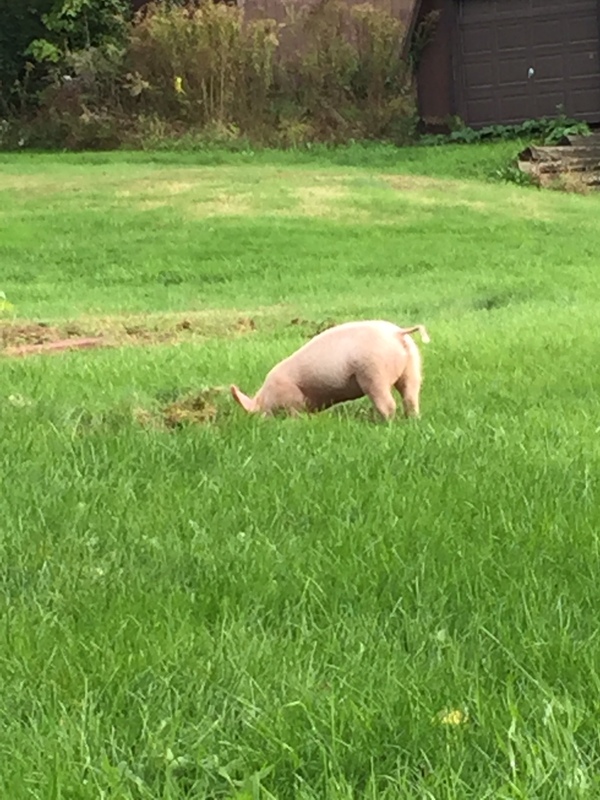 His snout, a perfect plow, pried the grass up in huge chunks of sod as he turned it over for the tasty fat grubs. Protein for a hungry little pig, with no farmer to throw him slop. In a Swiss Mennonite community with gardens and flowerbeds as neat as pins, this is definitely grounds for dismissal. Or capture. As the temperatures dropped to freezing, the good people of this community decided that the pig must be caught. A wad of high school boys were rounded up. 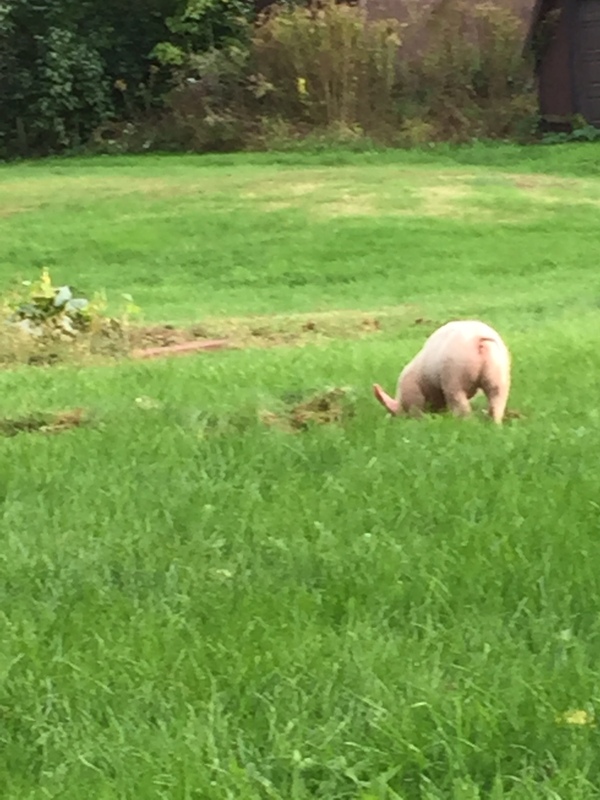 As the Lord’s day waned, likely during the height of Sunday afternoon football, they set upon Wilbur, chasing him down until his little pig legs could no longer sufficiently carry him far away. As he tired, they grabbed him. This I heard second hand, since I was not there as an eye witness. I loved watching Wilbur root up grubs. You’ve heard the phrase, “hog heaven”? He was living out his full pig-ness. Something we mostly deny animals in our culture. Whether a cat stuck in a house all day, or a calf in a tiny pen, awaiting his executor. So, you are wondering what this has to do with bees? As an advocate for humane care of farm animals, I often compare my raising of honeybees to the domestic animals we care for. Bees are considered livestock, after all. However, bees are wild and independent enough, with a fierce sting, that will keep humans from domesticating them in quite the same way. They evoke respect. Bees generally live out their bee-ness daily. They cannot be stopped from zooming out of the hive at first light to pollinate—orienting to sun and flower. They continue to mystify humans by their habits and behaviors, keeping us from utter and complete manipulation of them. Now that colonies are collapsing, bee welfare is still somehow beyond our control. And we can also change our ways to support them. I wonder if our main task in this day and age, if we want to become wise and loving with all our relations, is to let our non-human siblings teach us. Wilbur, I was rooting for you. I still am, wherever you are. You have my respect.